Whether you are a fan of DeWalt or not, you do have to admit that they make good power tools. 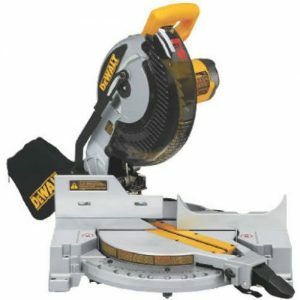 Check out their Dewalt DW713 10-inch Compound Miter Saw, which has long been a favorite of DIY-ers and professionals alike. In this Miter saw review, we will be looking at some of the DW713’s specifications and its top features. If you are interested in getting this saw for yourself, take the time to go through this compound miter saw review. Here are some of our top features for the DeWalt Compound Miter Saw. Cutting at 0 and 45 degrees, the DW713 offers its users precise cuts. This means that you will be able to make accurate joinery. It is perfect for those who are constantly working with moldings, crowns, and other appliqués that require precision. It is also a dream to work with when you are creating miter cuts. If you are uncertain about how accurate the Makita DW713 Miter Saw cuts, give it a test run. Cut a piece of molding at both the 0 and the 45-degree level. Afterward, measure it using a something you trust to see if it does deliver on its promises. The saw can cut crown molding easily because of its tall fence support capable of cutting 41/2 moldings held vertically. When you are making bevel cuts, the fence won’t stand in the way as it slides out easily enough. The design of this compound miter also allows it to handle wood measuring up to 2” x 6”. This saw sits on a table or on any relatively flat cutting surface and it will stay there. The weight keeps on solidly on its feet and we like it because it gives us a sense of security when cutting. For something that has a blade as sharp as this one does, you want it to be sturdy. The last thing you want is to have it moving up and down with the handle as you move the blade. Some uses complain about the weight of the DW713 Dewalt and at 40 lbs or so, it is a heavy saw. But, is it that much heavier than the other saws in the market? Hardly so, in fact there are some saws which are up 10 lbs heavier than this one and without having the capacity to deliver what this offers. The DW713 10-inch compound miter offers up to 5,000 RPM No-Load Speed, backed by a 15 amp motor. This allows it to cut through practically any wood without that much trouble at all. The cuts are precise and clean, no rough edges or raw looking corners. The blade is made up of long-lasting carbide steel. It doesn’t dull as easy and can withstand a lot of abuse. The speed of this Compound Miter also allows users to cut more than wood with it. Some have used it on laminate and on plastic sheets. To give the blade a longer lifespan though, it may be best to stick to the product’s recommended use. Here are some of the things people have to saw about this saw. “I was fortunate to have found a dealer with a DW713 Type 1 as his display model, so that I could then add the laser line or shadow line option to it. I really like the miter detents, especially because they can be re-calibrated when necessary. I also like the miter vernier scale that is used during re-calibration, as well as with any other miter angle after calibration. I am disappointed with the bevel scale and its pointer. The bevel scale pointer is so far from the scale, resulting in much parallax. All that you can get is the approximate bevel angle you want. The only precise bevel angles are 0º and 45º because you calibrated them. It took much bending of that pointer to minimize the parallax and make it parallel to the graticule marks. Why wasn’t that scale and pointer done like the miter scale and its pointer. “Bought a DW713 to assist with woodworking. After using the saw for a couple months wish I would have purchased one years ago as it cuts project time by a third and really make miters look professional! Great product. PROS: Runs smooth, simple to use, makes mitres easy to do. “If you are after a well made, basic, tough, reliable saw then i cannot recommend this highly enough. Does what it is supposed to do without any fuss. Easy to use and the miter lock works well. Great saw for the money. PROS: Durability and out of the box setup. One common complaint is that the DW713 saw is heavy, but for most of the people who have used it, the weight seems to be an advantage and not the other way around. It helps to keep the saw stable so you can work on it without any worries. Plus, you won’t need to be moving it around too much and if you do have to move it often, you can get a Dewalt Saw Stand to help you. This is a basic and reliable saw that does the work it says it will. But, there are some people who complain that the saw lacks some of the trimmings that other saws on the market have – laser guides for example. What we found was that you did not need those guides because the saw is accurate enough that you can trust. The other features are just unnecessary bells and whistles. If you are not sure of how accurate the saw is, test it out the first time you get it. Cut some wood and measure out what you get. We bet it’s going to be perfect. Anyway, if you really want laser support, this saw is compatible with Dewalt Laser and LED systems. You can learn more about this 10 Miter Saw from the Dewalt site. You can also visit its Amazon.com product page, it’s got loads of information. Very Good. It is as good as the Makita 10-inch Miter saw that we reviewed earlier. This Dewalt DW713 is a bit smaller at 10 inches, but it is still definitely a worthy saw. It may not have the bells and whistles of other saws, but it can just as easily outperform them. With a good brand name and great user reviews, this is definitely one saw to recommend. To get this Dewalt 10-inch saw, head on to Amazon.com. If you are looking for something to purchase together with your Dewalt Power Miter Saw, you can get the Dewalt Saw Stand, which we have also reviewed.